This was Soo good! I wasn’t sure I’d like the lime juice, but it really worked with the veggies/black beans. Thank you! Made this tonight for dinner, and it was fantastic! Love the corn, tomato and black bean salad. 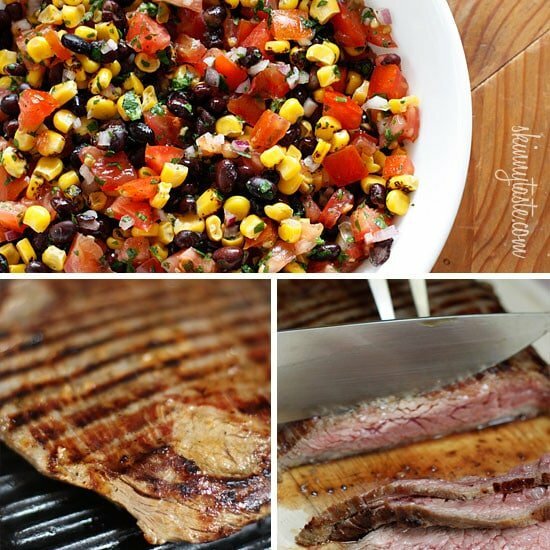 Such great flavors combined with the steak and the nice, easy seasoning blend. 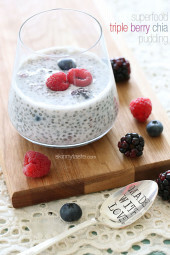 I am hooked on Skinny Taste, can’t wait to make more recipes! Such healthy, delicious recipes full of flavor! Made this tonite for dinner. Easy to make and delicious. Had skirt steak on hand in the freezer so used that. A little higher in tsp but but worth it – I love skirt steak on the grill. Definitely going to be a staple during the summer bbq season! 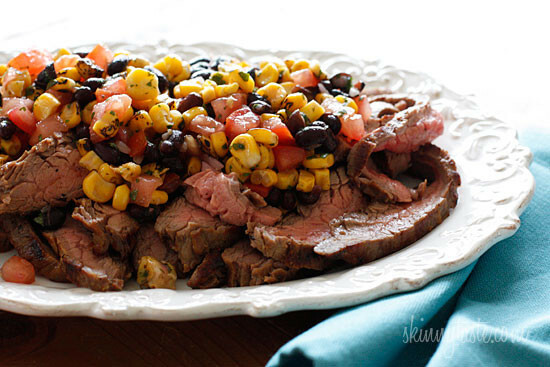 And the black beans, corn and tomatoes are a great side with so many other recipes. My favorite recipe this week. Super easy, full of flavor, kids loved it… soooo good. I made this for dinner tonight after seeing on your weekly meal plan this morning. My husband loved it as much as I did, and my 8-year old son really enjoyed the flank steak (huge win for the parents of a picky eater). Our outdoor grill didn’t have propane so I broiled the steak on high in our oven for 8 minutes on each side for a perfect medium rare.I’ve been a fan, and regularly check out and use your recipes, for about two years (I have both cookbooks!) but I started Weight Watchers last week and will be relying on your amazing ideas even more now. Thanks for all you do and for sharing with us! Made this tonight and served it with some jasmine rice and red wine. We absolutely loved it! 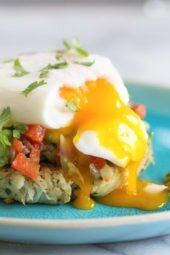 It is so flavorful and is quick to make. I made this tonight and doubled it, it was very good and I’m looking forward to eating it again tomorrow! My husband and 4 year old son loved it as well! The whole family loved this one. The only change that I made was that I added a sliced avocado to the black bean & corn mixture. Pretty good. Not up to par with some of your other awesome recipes, in my opinion, but fairly easy to make and it wasn't bad. I didn't much care for the black beans/tomatoes/corn mix. I think it would have been better heated instead of cold, but that's just me. I always warm up the beans and corn, then toss the salad together. I'm not a fan of cold corn myself. Do you thaw the frozen corn or put it on the grill? Just wondering how you aren't left chomping on frozen corn kernels. Thawed, or you can use fresh cooked. THIS IS LITERALLY THE BEST THING I HAVE EVER EATEN. MAKE IT YOU WONT BE DISAPPOINTED!! TASTES JUST LIKE CHIPOTLE! I used skirt steak instead and also used 1/2 teaspoon of ancho chili powder when seasoning steak. broiled 6 min. per side and sliced very thin. Everyone thought it was awesome. The salad wasn't a big hit with the kids, but the wife and I thought it was pretty good. Thank you! Positively delish. Looking forward to making often for my Mexican-loving family. Too much lime!! Other than that, perfect. What is the point value of the corn/bean/tomato salad per serving (or, how much of the points is the beef vs. the salad) – old and new points? Am I missing something or when do you cook the corn and bean mixture? I have an old recipe for this salad which calls for marinating overnight. Planning to serve it over grilled sirloin patties with a slice of red onion on top of the meat. Sliced avocado on a green salad would round things out nicely. I made this tonight and my whole family couldn't quite saying how much they liked it! Loved this dish…easy and very good! Can you do this in the oven instead of the grill? If so, what temperature and for how long? I really want to make this recipe but am not much of a grilling person. Thanks! I would broil it or cook it on a grill pan on high heat. Made this and served it just as you did in the picture except that it was on top of a bed of your cilantro lime rice. It was AMAZING. It was a huge hit with family and friends and it fed A LOT of people. My new go-to recipe when having guests! Thank you! Omg!!! So yummy and easy to make!!! I'm not on a diet – even though I probably should be – but I've been looking through your site for an hour now. And I'm DEFINITELY making this the next time I can for my boyfriend – he's a steak fanatic. Thanks for all the amazing recipes. I just discovered your website, and I love it! I made this for dinner tonight, and my husband was very happy. I had some left over lettuce so we took everything and made lettuce wraps. Super delicious. Thank you! 5 Stars to this recipe! It was delicious and came together really quickly. Thanks so much for the great blog- it has inspired me to jump out of our food rut, focusing on fresh, colorful and healthy! This was an amazing recipe, my whole family loved it. I loved how it was so healthy, tasty and filling. Thank you so much for sharing with us! My sister-in-law told me about your site and how her family loves your food, so I took a look and you have some delicious dinner meals on here. In fact my whole next week I am doing your meals for dinner only. Today I made this recipe, but with Rib Eye steak because my grocer was out of flank. This was wonderful! We have a steak house down here in Tacoma WA named Asado that makes almost the same thing. No longer do I need to go there and spend 30 bucks on one steak when I get get it for half! Thanks for the recipe! 5 stars! This recipe is perfect in so many ways! It's easy, inexpensive, quick, and extremely tasty. I have already recommended this recipe to a bunch of people. My only comment is on the flank steak cooking time. I used my outdoor gas grill set on high heat to cook the steak, but it only took a total of 7 minutes (3 1/2 minutes each side) and not the 6 to 8 minutes on each side. The steak turned out perfect with the 5 minute rest time under foil. Thank you for making me look like a pro. Made this tonight!!! Once again another GREAT recipe!!! My sons & fiance loved it!!! I made this tonight. I didn't have flank steak, but I had a beef tenderloin. OMG….This was SOOOOOO good!! I shared it with all of my WW friends! They are going to love this. Thank you so much Gina for all the good recipes you supply us WW with!! Made this Friday night and it was AWESOME! I used the left over's for quesadilla's which was just as good! Thank you Gina, I have spread the word about your web site to all of my friends and at my WW meeting. This web site has been a real blessing with my healthy lifestyle journey. You have found the way to my heart. This one is a meat lovers dream. Oh my gosh, just made this and I think it's the best thing I've ever made. So simple and delicious. I think I'll make the salad all the time now too. Just a note, I used just under a 1/4 cup of lime juice and I think that was plenty. 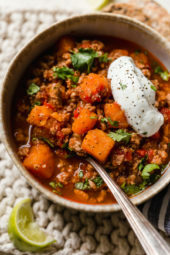 This looks very similar to a recipe from the weight watchers website that I had printed awhile back but your dishes always have so much flavor and I will be making this one! Wondering if that is a Foreman Grill that you used…. Made this last night, LOVED IT! Thanks for another winner! I made this for dinner last night and it was FANTASTIC! Thanks again for another wonderful, healthy meal! I made this, this evening! My husband grilled this on a charcoal grill. We all loved it including our 6 year old daughter. I will make this again. The veggie salad was pretty yummy & my daughter asked for more of the salad! We thought the veggie topping would make a great topping on a baked potato too. WHAT WOULD BE THE POINT PLUS VALUE OF THE SALAD ALONE? THAT IS A GREAT IDEA AND I LOVE THE THOUGHT OF DOUBLING THE RECIPE AND USING THE SALAD FOR SOMETHING ELSE! FABULOUS! I made this last night and it was my and my husband's favorite so far. I doubled the corn salad recipe so I could have it on its own for lunch today. I would also just make the corn salad to bring to a pot luck picnic this summer. Thanks! What a great recipe for Memorial Day weekend! I have been trying to find a good steak recipe for The Man! This recipe looks great. If you did not have access to a grill, could you cook the flank steak on the stove (sear it) and finish it off in the oven? Looks absolutely AMAZING! can't wait to try it. I can't wait to try this next week! I think it would be fantastic over greens as well. You could also make a soft taco out of this. I've been buying the corn/flour combo shells and this would be really good with it. 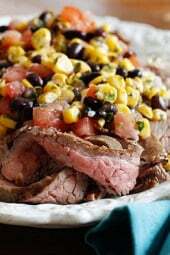 You've totally read my mind…I have been craving flank steak ever since I had the most amazing meal at Border Grill recently with steak and a corn/black bean relish. I'm definitely going to give this a try!! Do you think that you could add how much one serving of the topping salad would be? I forgot to measure the total salad, but it's 1/6th of the salad. Would this add additional points to the 5 stated? Looks delicious! 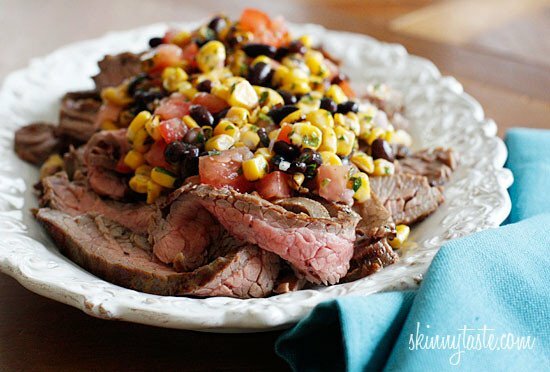 I'm always looking for new flank steak recipes as well, and I think this one might have to go on the rotation. Have you tried other veggies for relish? I love the idea, but I'm trying to cut out carbs in my recipes and wondering about ideas for subbing out the corn/tomato. Use cucumber and avocado instead!! Oooooo going on the grocery list. I have to say, you have made me a black bean lover after YEARS of hating them……thanks!!!! How would this work with Chicken Breast? I am not a steak eater. Would the seasonings for the steak work well with chicken also?? Love your blog….use your recipes ALL the time!! This would be great over grilled chicken! This looks amazing Gina! And what an inexpensive cut of meat. Being from Texas, I'd like to thank you for doing tex-mex right! Perfect to make and watch the Spurs game tonight.